i was looking at this photograph and thinking how wonderfully dressed my grandmother Mary was. even after 48 years i remember her silk shift at Pop's 75th birthday party in May 1970; and how she didn't mind when i wanted to be in the photo. she was wonderful with her red hair, pack of Marlboros and dirty martini's. it started me looking through photo albums and thinking about how someone wears a garment and has their own personal flair. the biggest influence in my life regarding fashion is my Mother Rita. she was always turned out and wore the right outfit for the right occasion. everytime i don a pin or throw a pashmina around my neck it's because of her influence. i thought i'd share images; not only of Rita but, my Dad Jim - he was a suit and tie man and my Mom's sister Marion who was always up-to-date sporting the latest fashion trends. here's another image from the party. Rita in green looking stylish. Marion in her mod brown and black striped dress - so of the moment. i love the gloves. here's Mary in that same dress with it's matching jacket at my cousin's wedding December 1970.
a close up of Rita - that beaded dress! Marion was the mother of the bride. Rita and Marion 1940's. sweet sisters. Puerto Rica 1954 this cinnamon pink cotton dress is timeless. Rita was a fashion model 1954.
my parents leaving for their honeymoon 1955.
i have this 1955 image framed - it sits in a cubby on my rolltop desk - i adore the styling of this blouse. Marion and Rita 1960 both look stunning. those colors! Thanksgiving 1962. My gorgeous Mother! i found this from spring 1967. i wish it was a full shot of her silk and linen brown dress. the beading was killer! this blue dress from summer of 1966 - wow! my grandmother Lillian had similar bags to this Enid Collins handbag. 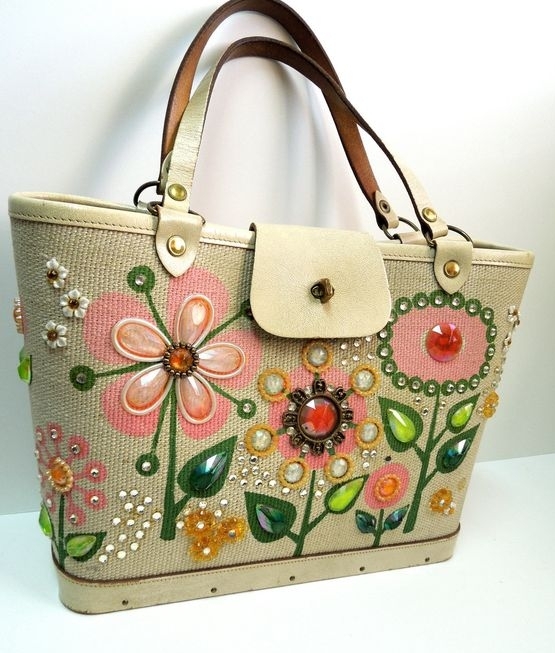 some of hers had straw floral embroidery. 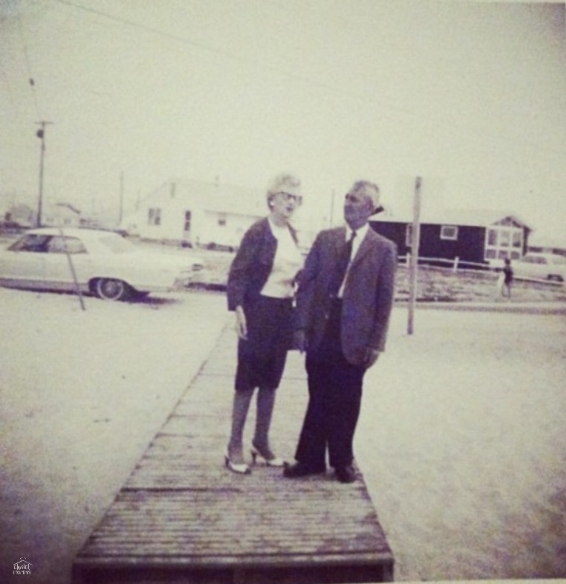 here are my Dad's parents Lillian and Joe on a pit-stop at the Jersey shore August 1965. something about this generation they were always fully dressed - even at the beach. my sister and Rita Easter 1968. stylin' and profilin' next to Jim's convertible. Marion looks amazing in her colorful coat. circa 1973. April 1974 Marion, Rita with their sister-in-law Gladys. That jacket, those sunglasses! I love how groovy Jim is with his white belt, bolo tie and white dinner jacket on our 1979 trip to Phoenix to visit my snowbird grandparents Lillian and Joe. when i worked for the Gap Rita and i had matching wool trousers - none of her friends were shopping there but, she loved the young fun fashion. i remember a great denim blouse she had - i wish i had now - it'd be back in style since it was over 20 years ago and i'm her size now... ha! on our 1985 trip to Ireland she was right on point in her cute Esprit outfit! "there is nothing wrong with being the most overdressed person in the room." i hope you celebrate your personal flair everyday!